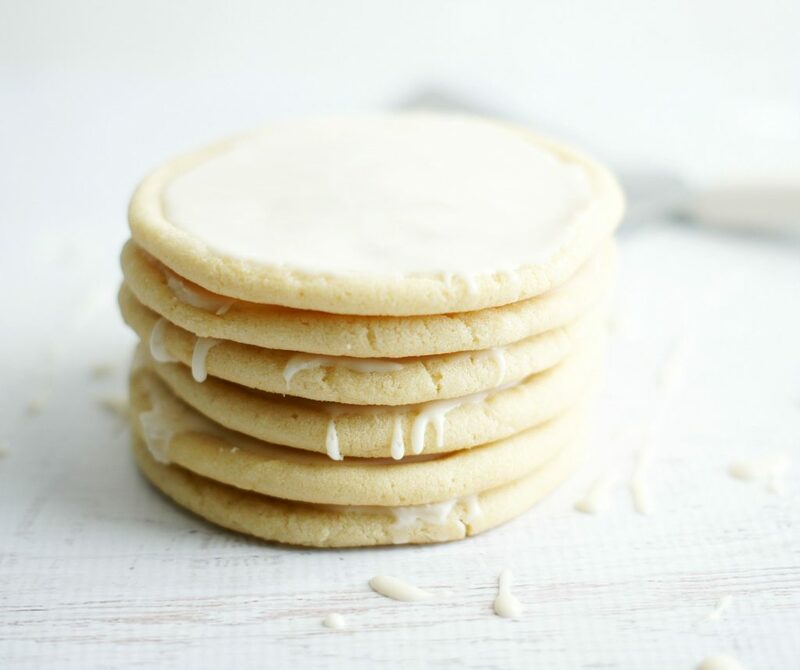 I know there are some of you out there who only make sugar cookies during the holidays, but in my world, sugar cookies happen year-round. We are huge fans of sugar cookies at our house. 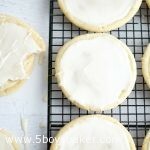 These Soft Maple Sugar Cookies were made in honor of my Parker who told me the other day I needed to make sugar cookies. He thinks I don’t listen to him, but these cookies are proof that I do. Buttery, soft, chewy and slightly crispy on the edges . . . these cookies are fantastic! What’s even better than the fact that these are really, really, delicious, is that there is no rolling and cutting involved. You just scoop the dough and plop it onto your cookie sheet. . .yay for scooping and plopping! Then top these yummy things off with a sweet maple glaze and you will be in heaven! 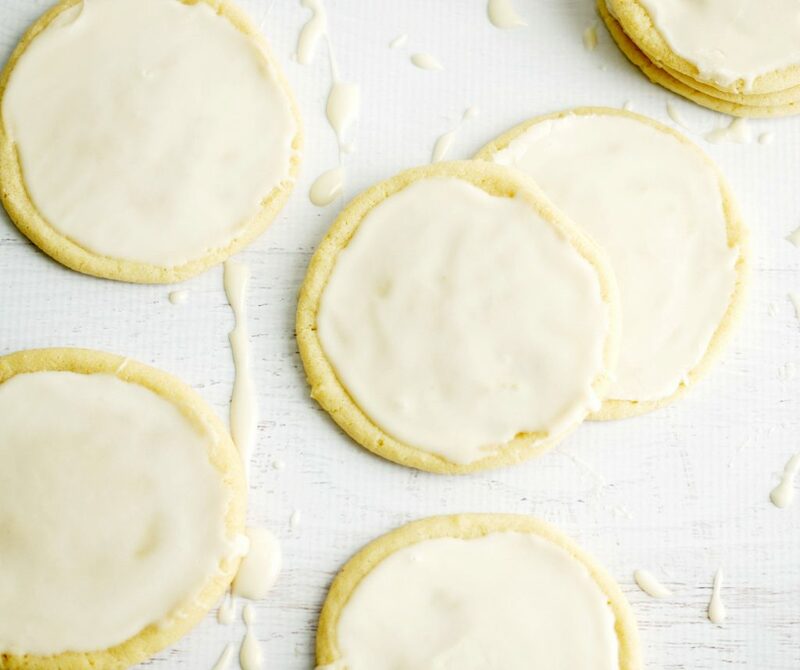 The maple syrup adds a little extra sweetness to these cookies that is just perfect. This is actually one cookie where I wouldn’t want a thick layer of frosting, just a thin one will do. The recipe actually called for just a drizzle of the icing over the cookies, but hey, a drizzle is just not quite enough for me Ü. I think next time I make these I might add a little bit of maple extract into the icing, along with the maple syrup it calls for. 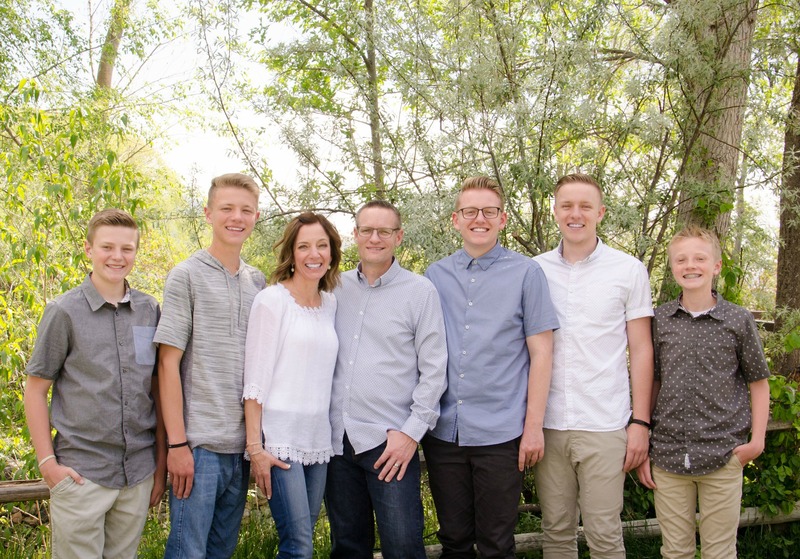 I can’t believe it’s our last Friday before my boys go back to school, this summer flew by at warp speed. We are all a little sad at our house about summer being over, so I think I’ll go drown my sorrows by eating another cookie. Have a great weekend. 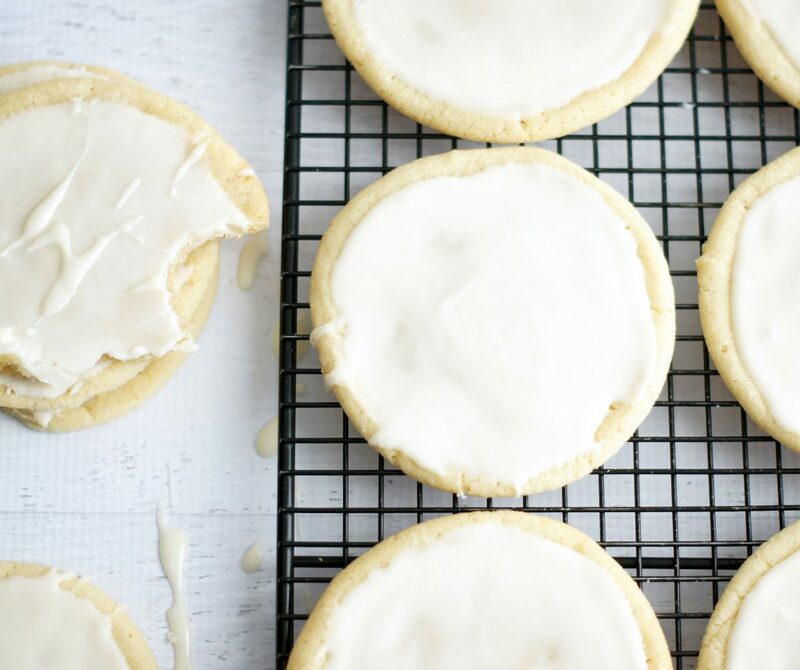 These Soft Maple Sugar Cookies are buttery, soft and slightly crispy on the edges. You will fall in love with them! Preheat oven to 300 degrees F. In a large bowl combine butter and shortening. Beat with an electric mixer on medium to high speed for 30 seconds. Add granulated sugar, brown sugar, maple syrup, baking soda, cream of tartar, and salt. Beat until combined, scraping bowl occasionally. Beat in egg yolks and vanilla until combined. Add flour and mix until well combined. Shape dough into 1-inch balls. Place 2 inches apart on ungreased cookie sheets. Bake for 12 to 14 minutes or until edges are lightly browned. Cool on cookie sheets for 2 minutes. Transfer to wire racks; cool. Centers will dip as cookies cool. Drizzle with Maple Icing. ICING: In a medium bowl stir together whipping cream, butter, and maple syrup. Whisk in powdered sugar to make an icing of drizzling consistency. Spread or drizzle over cookies. Made these cookies last night–they were delicious, but I had to put 2 3/4 cup flour in to make it any sort of dough. The 1 3/4 cup that the recipe called for left me more of a batter than a dough. Just wanted to double check with you, is it really just 1 3/4 cup flour? Hi Hollie, it is 1 3/4 cup flour. It’s a fairly soft dough, but definitely thick enough to scoop out with a cookie scoop and hold it’s shape. Not sure why yours turned out more like a batter. Glad they still turned out ok. Thanks for the reply. Now I’m just going to have to make them again and trust the softer batter and see if they are as good. Forgot to tell you I made these this weekend too! (along with the Halloween bark) They were delicious-or at least the dough was awesome! 🙂 Actually, the cookies were great as well! Thanks Christine! It’s a really good thing we go to the gym, isn’t it!? Could you use all butter instead of shortening? These look delicious. You could Tammy, but the cookies will go flatter because the shortening helps the cookies from spreading so much. If you want to use all butter, I would probably add some extra flour, maybe 1/4 a cup. You could bake a few first and see how much they spread and if you need to add more flour. You could also chill the dough for a bit before hand, that will help them not spread as much also. Shortening also makes cookies a little more tender so the texture might not be quite the same. Let me know if you give it a try. Thanks for looking.